Mmmm…more Vintage Fair goodies! 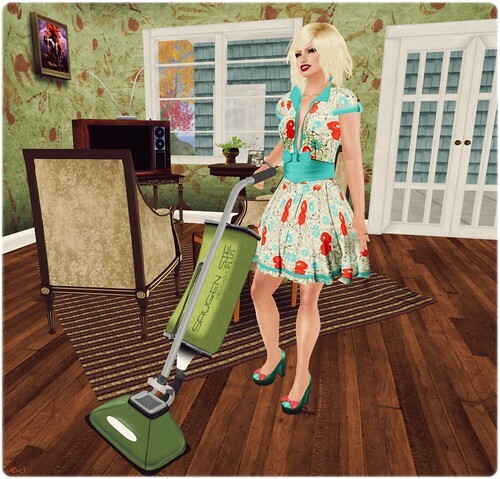 I’ve been setting up Funky Junk‘s new Pasadena house that is out at the Vintage Fair for the past couple of days. It’s all kinds of retro love! With Nana’s TV Room Set from Hanaya, also at the Vintage Fair, it just makes you step back in time! I was very excited to see Reale out at the Vintage Fair this year, especially with this adorable Soda dress! The skirt is a mix of sculpts and flexi, so you get nice movement, and the whole thing is really very figure flattering with the waistband and bow that hit in just the right spots. If you haven’t made it out to the Vintage Fair yet, be prepared for some lag, of course, but also be prepared to spend spend spend!! Oh! And I’ll be out there tomorrow [Sunday the 13th] DJing a Sock Hop from 7pm-9pm SLT! I hope to see you guys out there for some great old music and lots of fun! This month’s Spruce Up Your Space theme is So BoHo! I got utterly giddy when I heard the theme because that’s a style I like a whole lot! And I got even more excited when I found out Funky Junk was going to be in it. Look at this CUTE little house Ulaa made for the event! Isn’t it just adorable? Well, if you think this is good – let’s take a look inside!! 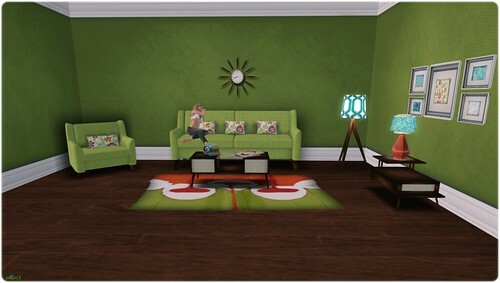 The living room is large and spacious with a fun wallpaper! Lots of room to pack in your favorite stuff. 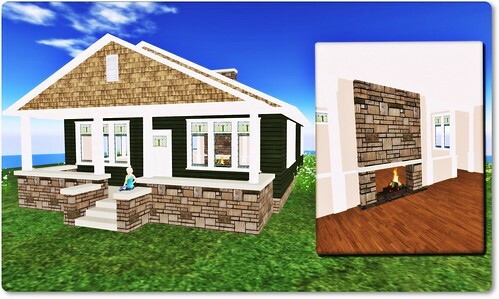 The fireplace facade with the art and stuff on top is also included in your BoHo Cottage, but is of course removable if you need to save on prims. If you look at the two Fondant Poufs in the middle of the room, those are from LISP Bazaar, on sale for SUYS this weekend as well. I set up this room as a kitchen/dining area. The large windows have a really cool soft colored texture that tie in with the wallpapers in the house, and with the stained glass in the house. 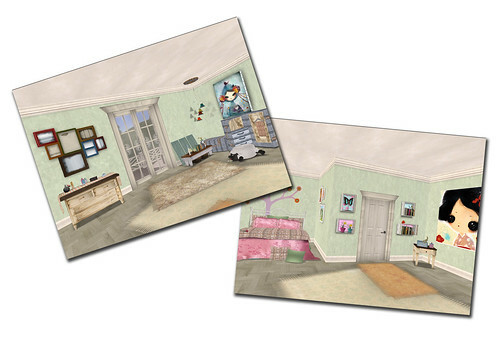 And of course, what’s a house without a bedroom? I wasn’t quite sure about this wallpaper when I first saw it, but I gotta say, it totally grew on me. It’s just so different and so … boho! The Mia Palette Bed that I’m laying on is from Mudhoney and is also for SUYS this weekend. It’s so sweet, and fits into this house SO well. The Funky Junk BoHo Cottage comes with 2 sets of texture change drapes, 3 pieces of wall art, the fireplace mantle, and a scripted porch light. It is 99 prims rezzed by itself, 172 with all the extra goodies. Everything is copy/mod, no transfer. Spruce Up Your Space for this weekend is only a few more hours, but I’m pretty sure you’ll be able to pick up these items at regular price after the weekend is over if you miss it. At any price, it’s something you’ve got to have! So like I said in my last post [god, I am slow lately! ], Funky Junk came out with a house that is very near and dear to me. Why? Well, for one, it’s based off an idea I showed to Funky Junk creator Ulaa Coronet, and she totally put her own spin on it and made it ten times better than I imagined. 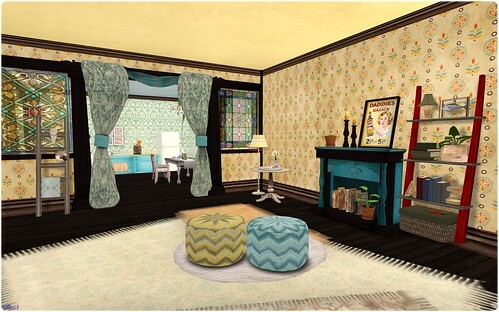 And two, she named it after my sim – Bluebonnet! Gorgeous, right? It features a wide porch [necessary because I MUST have a place to drink my sweet tea! ], two balconies, and a good sized patio. Inside, it has JUST the right amount of rooms – living room, kitchen, bedroom and bathroom. There’s also a little area that you could do pretty much anything with. Check out the pics of the inside! The living room/front entry way. Upstairs area – I turned it into a reading nook! 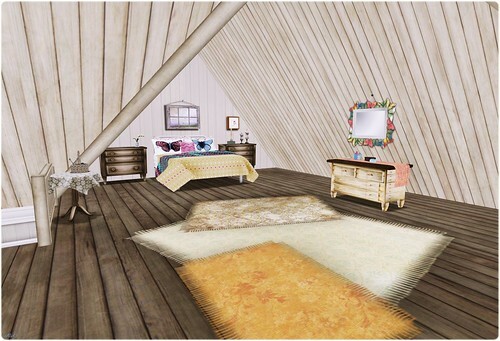 Bright and cheery bedroom! My favorite room in the house! 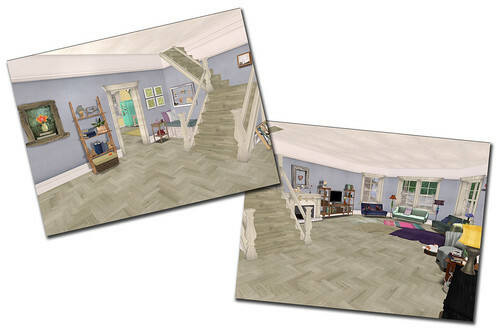 The Bluebonnet house is 267 prims and is a 17×29 footprint. It is copy/mod, so you can mod away to your heart’s content to make it fit your style better. 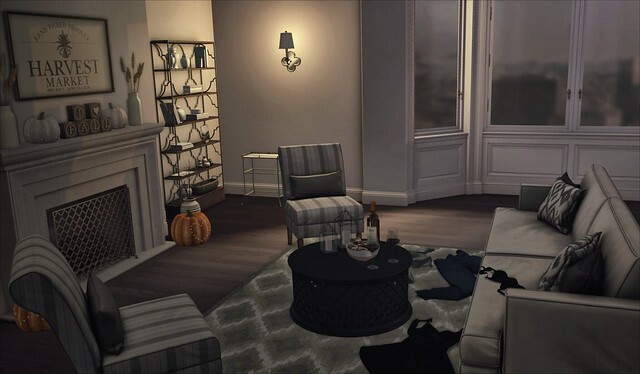 But of course, this is exactly MY style, so I didn’t have to do anything to it except fill it with furniture. 🙂 Head over to Funky Junk and rez a demo! You will just fall in love with it! There’s no way I could possibly name all the furniture/accessories I’ve used in this house, but here are a few of the stores where you can shop for great home/garden things! Are you as much as a prefab addict as I am? I simply cannot resist when I see a little house or skybox that I like! When Funky Junk owner Ulaa Coronet decided to bring out one of her best selling homes in pink for Valentine’s Day, and then slapped a $50L tag on it… well, you can imagine how excited I was! Eeee! It’s so cute! This is a recolor of her Quaint home, so it’s named My Quaint Valentine. I could just squeal over the cuteness, but you probably want details, am I right? 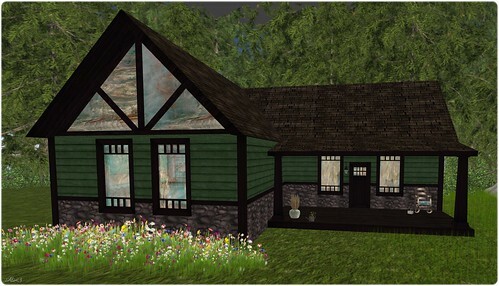 This house has a 6 by 16 footprint and is 72 prims. Ulaa is awesome [and I don’t say that just because she’s my partner!] 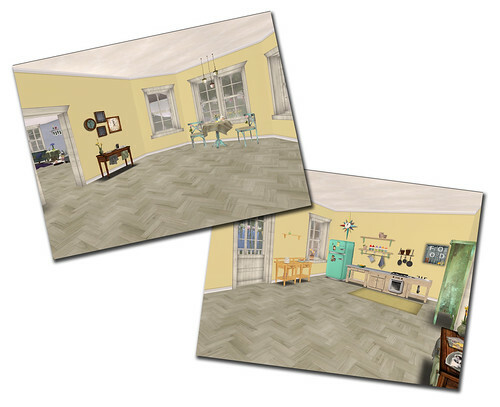 and she’s included some matching accessories – table, chairs, texture change rug, fireplace facade with the flower basket, and a window flower box. Altogether, it comes out to just 132 prims! And of course you can not use the accessories, if you don’t want to. The house is copy only, no mod and no transfer. For only $50L, it is a heck of a deal! Go to Funky Junk now!! This deal is only available through Valentine’s Day. I’ll be showing you another of the new homes from Funky Junk that is near and dear to my heart later this week, so keep an eye out! So by now you’ve probably heard of the House & Garden Hunt that’s going on. But you might be asking yourself “Hey! Where am I going to put all my new furniture?” I have a suggestion! Bacchitecture is one of the newest prefab shops to hit the grid, and oh! The houses are just lovely! 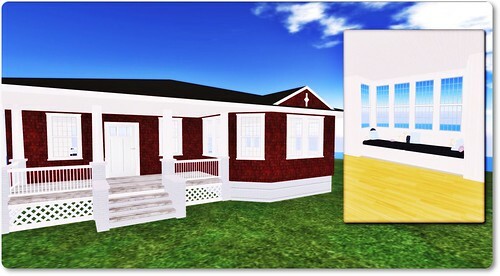 Owner Bacchus Ireto was kind enough to drop some houses on me [um, not Wicked Witch style!] and I had so much fun rezzing houses to play in! Bacchus is the former curator of the Frank Lloyd Wright Virtual Museum, and draws his inspiration from American vernacular architecture, as well as the buildings of Frank Lloyd Wright, Louis Sullivan, Mies van der Rohe, and Robert A. M. Stern. Let’s take a look at two of my favorites, the Llewellyn and the Lutsen! I am a huge fan of very tasteful, classic homes. I don’t usually get into the whole modern thing, and so these two prefabs worked really well for me! They are built beautifully, and the insides are just as pretty, without being overwhelming at all. That is really awesome because then you can decorate to your own taste without feeling like the house is forcing you into something. Yes, houses force! 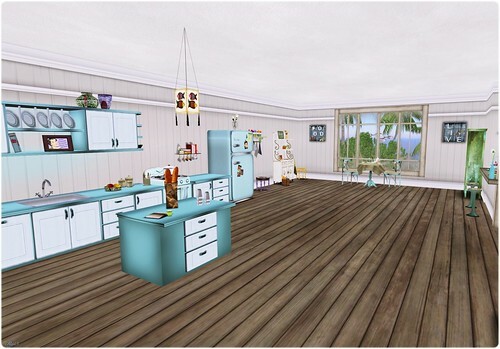 There are several houses to choose from at Bacchitecture, so head on over and rez some out to look in. I bet you’ll find one that you just can’t live without! I love the Pocket Gardens by Stormy Aluveaux and Carter Denja. Anytime I need an instant garden [because I’m horrible at landscaping! ], I pull mine out and boom! Insta-pretty! I was super happy to see the new Castalia Basin with Koi, because who doesn’t need some cute fish in their life?? The basins go really well with the Castalia prefab gardens. Both basins come with color change scripts for the basin itself, and for the roses attached. The fish are so cute and swim in circles. There are even sits on each basin [as shown in the top picture] and one of the best parts? Low prim! 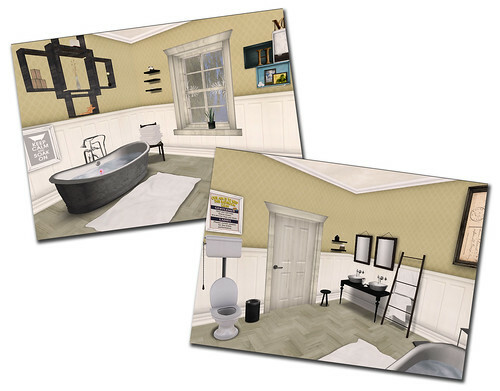 The small basin is 7 prims and the large is 10 prims. 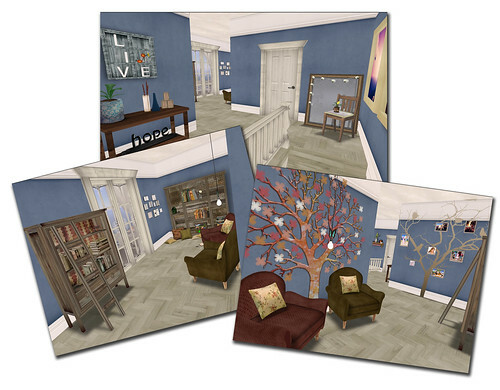 These are GREAT if you’re in one of the new Linden homes! These are very affordable, too! The small basin is $125L and the large is $175L. Or get a little discount and get both for $250L! They are copyable, so you can put fish out everywhere! Go pick up your new koi at Pocket Gardens today!